Remember that horrid thick medicine you were spoon-fed as a child to keep you healthy? Read on to find out just how poisonous the castor oil plant is and you will be shocked! There is an ingredient in the castor bean, which just so happens to be the deadliest plant poison on earth! Yeah, I thought the same thing too. Literally. 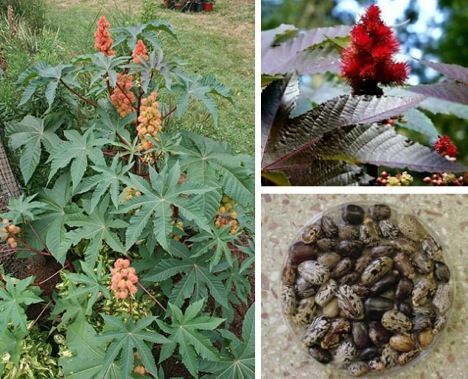 Just one tiny castor bean is enough to kill an adult within a few minutes. Castor oil is made safe (but not palatable) with the removable of the lethal compound known as ricin. Amazingly, castor bean plants are grown for decorative purpose all over the place, particularly in California. From the bean behind castor oil to the world's deadliest decorative shrub, you may be surprised to find out the incredibly lethal plants often hanging around the neighbourhood parks - or gracing your tabletop in the form of a centerpiece. Discover more poisonous plants. And find out more weird and wonderful things I did while writing my historical conspiracy thriller.